AVG is one the best alternative among free antivirus software. If your PC is getting slow or you just got a new PC, after you decrapify your computerÂ of unnecessary trial software, get a good security software installed on your computer. AVG basic free edition is more than enough for your home PC offering protection you need. It provides real time safe internet surfing by showing icons next to each search result when using Google search. It has automated scanner feature that scans system at specified time for malicious activity. It also blocks opening of any infected file thereby preventing spread of infection. After you download and install AVG antivirus, make sure you update it reguarly to keep system protected. It is easy to use, free and does not cause much strain on system resources (unlike popular software like Norton and Mcafee). 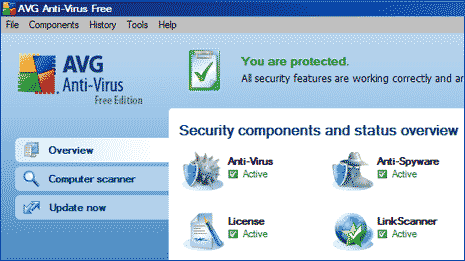 Download AVG Free antivirusÂ and stay protected from viruses and spyware – a must have!